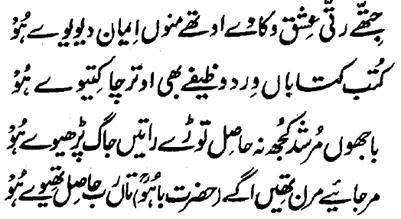 Hazrat Sultan Bahu Rahmatu-Allahe Ta-aala Alaihe says that one should give thousands of kilogram Eimaan in lieu of a milligram Ishq wherever he finds this opportunity and even if one has to barter the Ilm of the books and the Wird and Wazaaif with Ishq in this transaction, he should not hesitate. This Course cannot be got without the Waseela of the Murshid and the merchant of this stuff should buy this priceless asset in price of his head and wealth. One should (virtually) die before his physical death. Only then, he will get the Wasal of the Sustainer .